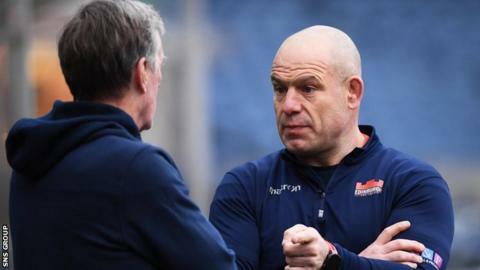 Edinburgh remain "under pressure" in the race for the Pro14 play-offs despite beating Leinster, say head coach Richard Cockerill. The victory at Murrayfield moved Edinburgh into fourth in Conference B, two points off the final play-off spot. They face Scarlets, third-place Ulster and rivals Glasgow in their final three league matches. "I don't care if it's ugly, we've got to win. It's not about entertaining," Cockerill said. "We've got a lot to do, it's a really tough run and we've got the small matter of a [Champions Cup] quarter-final [against Munster] in between. "We're under pressure because we put ourselves there by poor results earlier in the season." Tries from WP Nel, Ross Ford, Viliame Mata and a penalty try was enough as Edinburgh came from 8-0 down to overpower an under-strength Leinster side 28-11 and register a crucial bonus-point win. John Barclay made his Edinburgh debut in the match, having been on the sidelines for 10 months with a ruptured achilles, and despite going off briefly for a Head Injury Assessment, he lasted the full match. "I enjoyed it a lot, the thing I was probably most anxious about was how I would hold up- my lungs," the Scotland captain said. "I was happy to be back out there, it's been a frustrating 10 months," Barclay added. Next up for Edinburgh is Irish side Munster in the last eight of the Champions Cup at Murrayfield next Saturday. It is only the third time in the club's history they have reached the knockout stages of Europe's premier competition, while Munster have won the title twice. And despite the potential for a record crowd at Murrayfield, with over 30,000 tickets sold, Cockerill is only interested in the result. "It's not about having a day out, it's about doing ourselves justice," the Englishman told BBC Scotland. "Everybody keeps telling me it's going to be a great occasion, I don't want it to be a great occasion I want it to be a great game and I want us to win. "These are the games you want to play in, these are the games you learn about the men you coach, and the people you work with," Cockerill added.